This series is a spin off to the High Witch Series. When Erica meets Gareth, she feels excited that she may have found her first love and wants to see him as much as possible. But a vision featuring Erica and the dreaded test darkens her world and leaves her wondering who the mysterious blond man from her vision is. Gareth is falling for Erica, but he’s hiding a dark secret. If she knew, she would despise him forever. He hates deceiving her but feels trapped. He has to choose between saving his father or protecting the woman he’s falling in love with. He can’t bear to hurt either, but a dark stranger has other ideas. As you might have seen on my blog, this isn’t the first book by author Mona Hanna that I’ve read. I was really happy to see that the High Witch series had a spin off since I really liked reading those books. 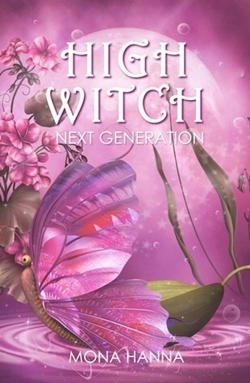 This new series is called Generations and starts with the first book, High Witch Next Generation. It is a pretty short book but I still enjoyed it very much, the lovely and magical writing style of the author making you want to read more and more. This book was a really cosy reading, really good to the heart and soul. I found it relaxing and didn’t want to finish it on the first day. Some of the characters of this book will be familiar to those who have read the High Witch series but we still get to meet new characters that are really important to the plot. The action follows Erica, the daughter of Ariel who is one of the High Witches of the world. As her mother, Erica is also a High Witch, a very powerful and special kind of witch. While having a high witch reunion with Hallie (another high witch) and her family, Erica’s attention is caught by a strange boy that looks at her. The boy, named Gareth, will play a very important role in this book, a romance story revealing even since the beginning of the story. But will the feelings of love be strong enough to overcome some unexpected complications? I really liked that, although it is a short book, it has everything included: romance, magic, friendship, family, tough situations, good and bad characters. The action is a little fast paced, fact that helped the action to evolve enough. I felt that the ending of the book will be a cliffhanger but Hanna had the talent to include everything that I wanted to find out in the last chapters. I am really curious what the new couple Erica – Gareth will go through in the next books since this was just the beginning of everything! I think that this is a really wonderful book for those who like short romantic books that include fantasy elements and is centered on family and friends. I also encountered a few funny moments that made me giggle and enjoy myself. I really love small books since I can read them fast without and I can also carry them in my bag everywhere I go (every reader’s dream)!! Erica smiled at him. She leaned in to kiss him again.